Horse-riding that used to be an elite hobby now has takers from various sectors of the society. 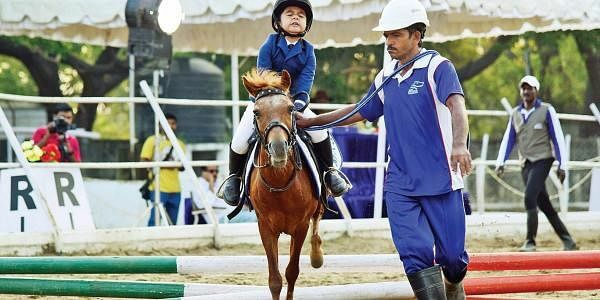 Horse-riding that used to be an elite hobby now has takers from various sectors of the society.CE visits Madras Riding School, the oldest horse riding ground in Chennai to find out more about it. CHENNAI: The clock strikes five and we see a barrage of cars entering the gates of the Madras Riding School (MRS). The sight of children dressed in sharp-collared t-shirts, elastic pants and boots is a common sight here. “I want to ride Safio today,” says one of them as he purposefully strides into the premises, waiting to mount his steed for his training. Partnering with the International Dressage Development League (IDDL), MRS holds monthly international qualifiers for its riders. KS Premkumar, secretary MRS, likens dressage to ballet as he attempts to describe it to us. With over 45 participants for the qualifiers this weekend, he is happy by the growing number of people, particularly children, who are embracing the sport. Folks at the riding school record each rider’s test and send them to IDDL officials. Judges from the Fédération Equestre Internationale, the international body for all Olympic equestrian disciplines, make a score sheet and write their comments. They also come to the school to participate in the tests from time to time. The trials held at the riding school are often accompanied by a show jumping event — serving a dual purpose in the process — training riders in the nuances of the show event and acquainting parents with the sport in its entirety so as to kindle interest. “Horse riding is an art. You are one with the horse and the horse is one with you. That level of love and compassion transforms you as individuals and it’s great when children are being exposed to this,” says Sai Chaitanya, one of the trainers at the school. The 22-year-old takes us around the premises, introducing us to the beasts and explaining their body markers. The stables are well-ventilated and clean, with a regular supply of oats and bran and enough water for the steeds. “Many retired race horses and rescued ponies make their way to our stables. They have a better life here, among riders who learn to love and respect them,” says Sai. Dhananjai Golla, the head coach at MRS, is full of stories of how his students have benefitted from the classes. “Posture, flexibility and general health is given a big boost when you ride and train with a horse but I think the biggest beneficiaries are your confidence and patience levels. I have had a dyslexic child here, with limited functionality of his legs, who is happiest when he is on his horse,” he notes. Incidentally, the child went on to clinch gold in show jumping event held this weekend. Veteran actor and committee member, Prabhu concurs, and recalls how horse riding brought a change in his schedule and temperament. “Whether you’re seven or 70, horses are for all. Activities and spaces like this are necessary to pass that gift on to generations. I am too heavy to ride now; so supporting this place is my way of passing on the gift (of horse riding) I got from my father to the youngsters here,” he says, as he cheers on the riders. The Chinna Thambi actor has also gifted Marwari horses to the school to educate people about the need to patronise indigenous variants. One of his horses, a massive grey gelding — Yuvraaj, is a much-admired animal at the stables here. Meanwhile, horse riding has had a bittersweet tryst with folks in the city, considering it is often seen synonymously with horse racing. “Earlier, horse riding has patronage only from the army here. It was an elite hobby, due to its cost and status but that has changed today,” smiles Premkumar.